This Mini DiverCity review was made after playing the game 10 times. We were sent a copy of this game by the publisher in exchange for an honest review. Mini DiverCity is a limited communication card game in which you’re attempting to convince the government to turn your city’s coral reef into a national park rather than letting corporations take it over. Similar to Hanabi, players can never look at the cards in their hands and they can’t talk about strategies. Mini DiverCity was designed by Maxime Tardif and is published by Sphere Games. Mini DiverCity is all about trying to keep species from going extinct as corporations are attempting to use the area’s natural resources for their own gains. You want to be proactive as much as you can to help the species survive, but often you have to react to what the corporations have done. Everyone will have hands of Species cards, but the cards will be facing the other players (à la Hanabi). No one will know what they have unless they play cards blindly or they get help from their teammates. There are six Species Scale cards, each with two of the 12 species on them. Throughout the game the species’ tokens will be moved based on what the players and the corporations do. The tokens can be moved as long as they are in the red, blue or green zones on their cards, but no one can move them once they’ve gone extinct or have been saved. Each round consists of a Corporation’s turn and a Diver’s turn. During the Corporation’s turn the active player draws a Corporation card and resolves it. During the Diver’s turn the active player takes one action. The Oil Platform – The active player discards a random Species card and moves that species closer to extinction. The Dynamite Fishers – Draw a Species card and move that species closer to extinction. The Hotels – Flip the two hotels shown on the card. Combo Cards – These cards have two of the three consequences listed above. Play a Species Card – Play a Species card and move that species closer to Survival. Use Walkie Talkie – Tell another player all of the cards they have in their hand. Close Down a Hotel – Discard a random Species card and flip one hotel back to its Island side. Each player will also have a one-time-use Diver Card that they can use during one of their turns. These are special actions that range from saving species to looking at your hand of cards for free. 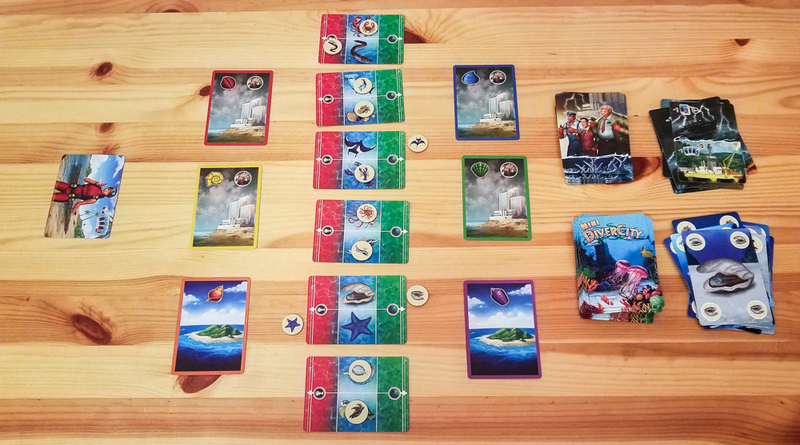 You’ll lose the game if all six hotels are built, if too many species go extinct (based on the difficulty level you chose at the start of the game), or if the Species deck runs out and the active player can’t take an action. You’ll win if you save enough species (again, based on the difficulty level). Unlike most limited communication games, Mini DiverCity has a theme. I wouldn’t say the theme is super strong, but being able to say names of species rather than numbers is a nice change for this type of game. Plus, it’s pretty funny when someone chooses to save one species over another simply because they like that species just a little bit more. There’s a great pace to this game. You’re just drawing a card, taking an action, and then it’s the next player’s turn. Even if you’re playing with four or more players, you can expect your next turn to come around in no time. I like that it uses Hanabi’s hand management mechanics in new ways. The biggest difference between the two games is that you aren’t taking a huge risk in Mini DiverCity when you blindly play a card. In fact, that’s your best option in some cases. The artwork is great and really pops, especially on the Species cards. Mini DiverCity has a very simple set of rules. It takes about 10 minutes to read through the rules and only about three minutes to teach. There are multiple variants in the rulebook, including solo and competitive rules. If you end up enjoying the game, you’ll have plenty of ways to play. Mini DiverCity plays up to seven players, so it’s one of those rare fillers that you can play with just about any group. It also has a small footprint, so you can play it pretty much anywhere. Probably my biggest issue with Mini DiverCity is that you can have two or three consecutive unsatisfying turns. The real fun in the game is figuring out what you have in your hand, but often you go multiple turns pretty much just playing defense. You really don’t want to spend your one action flipping a hotel, but that’s often what you have to do. I like that Mini DiverCity is tough, but I do think that they should have included one or two “Nothing Happened Today” cards in the Corporation deck. The game would still be challenging, but those types of cards would give the players a bit of a breather and allow them to take actions they actually want to take. Most games are winnable, but you definitely can get unlucky with your draws. If you happen to draw a bunch of those Corporation cards with two consequences on them early on, you’re probably not going to have a chance to come back and win. My group seems to really enjoy these types of games, so I’m not surprised that we’ve had a good time playing Mini DiverCity. I prefer some other limited communication co-ops over Mini DiverCity—specifically Cahoots, Codenames Duet, and Hanabi—but I’ll still be keeping it in my collection since it does have a unique feel to it. It’s quick, it’s very challenging, it has great art, and it has a pretty cool theme, so plenty of people will be satisfied with this one. Oh, and if you like solo games, you should definitely check out Mini DiverCity because its solo mode is excellent. 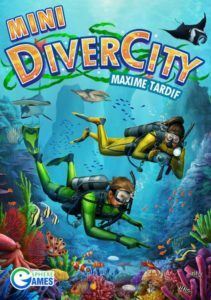 Thanks for taking the time to read our Mini DiverCity review! To stay updated on all things cooperative board games, follow us on Twitter, Facebook, or via RSS.